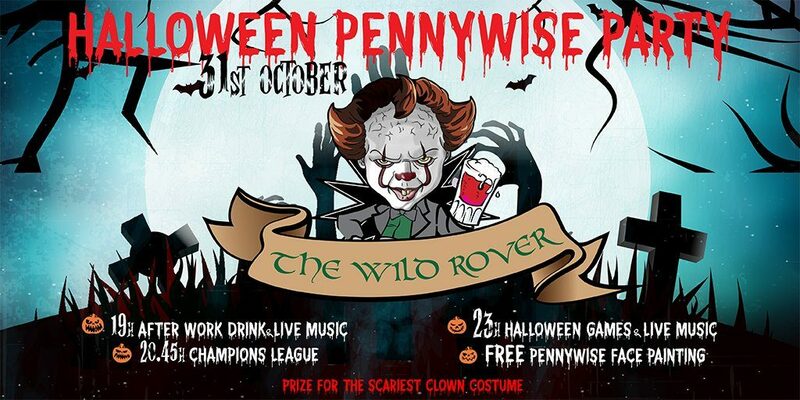 On the 31st October The Wild Rover Irish Pub Barcelona is hosting the most horrific, terrific and downright gruesome Pennywise Halloween Party Barcelona has ever seen. Come out of your zombie trance, crawl from the grave and shake your bones because we’re going to raise the roof. We’ll have live music, party games, special prizes for the best Halloween costume and if your don’t come dressed up, don’t worry we’ll have a professional make-up artist in-house to panit your face for Free. On our HD screens we’ll be showing the cheesiest horror movies from your youth all night so you can grimace, cry or even laugh along to your favourite classic gore. You may or may not know but the festival of Halloween is originally celtic. Long ago the Celts celebrated new year, known as “Samhain” at this time of year. It was a time was the dead came from their graves and walked among the living. This tradition carried on into to the present day and recent past. We bringing this back to life at The Wild Rover Irish Pub, at our exclusive Halloween Party Barcelona 2018. In Ireland and other parts of the world people dress up as ghosts, ghouls and the undead to be able to pass unnoticed amongst the spirits. Hence the tradition of trick of treat. People dress up as their favourite Halloween character and pass from house to house, imitating the dead’s search for a new resting place. If a treat is not given by the resedents of the house then a trick will be played on them. At The Wild Rover Irish Pub Barcelona we’re all over that. This year at our Halloween Party Barcelona 2018 we’re offering special prizes for the best Halloween costume. In the recent past people would light candles and leave them in the window to make ward off the roaming dead. In a round about way the story of Jack O’ Lantern springs from this tradition. Jack was a rogue and gambler and when he died he went straight to hell, but he tricked the devil and broke free. The devil caught up with him and made a wager, Jack lost. In return Jack lost his head and had to wander for eternity looking for a fresh head to find. To Commemorate this story the Irish would carve heads from turnips and put candles inside to make lamps. When Irish immigrants arrived in the United States, they found a better vegetable to make lamps from, the larger and more co0lourful pumpkin. And so one of the most famous present day symbols of Halloween is the carved pumpkin lamp, otherwise known as the Jack O’ Lantern. Lose your head at The Wild Rover Irish Pub Barcelona at our Halloween Party Barcelona 2018. Most Irish people love and old tale and are terribly fond of a good ghost story. Here at The Wild Rover Irish Pub Barcelona we pride ourselves on customer service. Consequently Halloween night is often celebrated beside a roaring bonfire where the old stories can be evoked to scare the whits out of any listener. Come one, talk all. If you want to come long by yourself, don’t worry, you’ll always have someone to talk to. So all said and done, you miss this Halloween Party Barcelona 2018 and you’re dreams will be haunted foreveeeeeer!! !